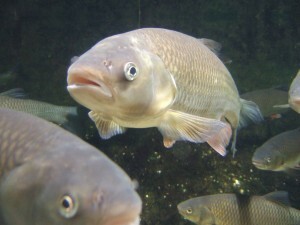 Grass carp (Ctenopharyngodon idellus) in aquarium. An estimated 1.7 to 8.7 billion farmed individuals of this species are "harvested" for food each year. It is estimated that between 48 and 160 billion* (ie 48,000,000,000 – 160,000,000,000) farmed fish were slaughtered for food globally in 2015. This is an update to an earlier estimate of between 37 and 120 billion* farmed fish slaughtered for food globally in 2010 and details of the estimating method are given in the pages below. Details of the estimate are available for global production and by country and by species. * rounded to 2 significant figures.